You can enter once on each method for a total of 3 entries. Click here for Instagram - this one is in the rules, but I don't see the giveaway post on their page, so may have to skip this one for now. Try checking back later maybe they will post it at a different time. This is from their rules: " Instagram: Go to https://www.instagram.com/boostmobile , become a follower of @BoostMobile (if you are not already doing so), “Like” the Boost Mobile Sweepstakes post, then use your Instagram account to reply to the Boost Mobile Sweepstakes post with a comment which includes a personal testimony about why you love Boost Mobile and include the hashtags #BoostLoveNotes and #Sweepstakes to receive one (1) Entry"
Grand Prizes – Three (3) potential winners will each receive one (1) Boost Mobile Samsung Galaxy S9 (Model SPHG960UABB) (ARV: $699.00) in a color determined by Sponsor and a $50.00 Boost Mobile Gift Card (certain terms and conditions as specified by issuer apply). Mobile device service will be locked for 12 months from date of Boost Mobile activation. Total Grand Prize ARV: $749.00 each. The total ARV of all Grand Prizes is $2,247.00. First Prizes – Five (5) potential winners will each receive one Boost Mobile Moto e5 Plus (ARV: $179.99) in a color determined by Sponsor and a $50.00 Boost Mobile Gift Card (certain terms and conditions as specified by issuer apply). Mobile device service will be locked for 12 months from date of Boost Mobile activation. Total First Prize ARV: $229.99 each. The total ARV of all First Prizes is $1,149.95. 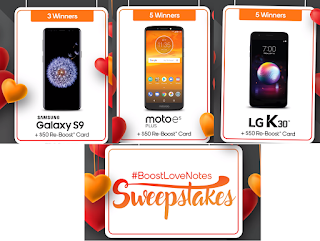 Second Prizes – Five (5) potential winners will each receive one Boost Mobile LG K30 (Model LGX410PMABB) (ARV: $149.99) in a color determined by Sponsor and a $50.00 Boost Mobile Gift Card (certain terms and conditions as specified by issuer apply). Mobile device service will be locked for 12 months from date of Boost Mobile activation. Total Second Prize ARV: $199.99 each. The total ARV of all Second Prizes is $999.95.